“And suddenly from heaven there came a sound like the rush of a violent wind, and it filled the entire house where they were sitting. Divided tongues, as of fire, appeared among them, and a tongue rested on each of them” (Acts 2:2-3). It is difficult to describe the indescribable. It’s as if the Gospel authors didn’t even try to explain the resurrection. Mary came to the tomb and found that the stone had been rolled away. With the exception of Matthew’s description of an earthquake and an angel, that’s about all we have to describe Jesus’ resurrection. It could be that while Jesus walked with the disciples during the forty days after his resurrection he never revealed exactly what happened. I would imagine that at least Peter, James, or John would have asked. On the other hand, maybe Jesus did describe what happened in the darkness of the tomb, but even words couldn’t fully contain the “other” of what resurrection is or was or will be. 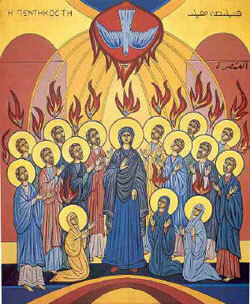 And then we have the day of Pentecost. Luke, the author of both the Gospel of Luke and the Book of Acts, tried to describe what it was like for the Holy Spirit to come upon the disciples who had gathered together in one place. Just saying the first few words aloud should make the hair on the back of your neck stand up. Go ahead. Read it aloud-“And suddenly from heaven there came a sound like the rush of a violent wind.” Don’t you almost expect it to happen again while reading it out loud? On the one hand we have the darkness of an empty tomb, and on the other we have an ecstatic experience of a rushing wind and dancing fire. There’s such a stark contrast in how resurrection and Pentecost are described. It’s like when you are falling in love. You meet, you talk, you walk, you embrace. There’s something about the other person that wakes you up in the morning, but words just don’t adequately describe the butterflies in your stomach and the skipping beat of your heart. Then you say to each other, “I love you,” and then there’s something like the sound of a rushing wind and everything just feels right. You couldn’t describe it before, and maybe can’t after, but the world could be crumbling around you and it doesn’t seem to matter. Jesus was raised and fifty days later Christ and humanity exchanged an “I love you,” that forever shook even the words on our tongue. Now that’s worship!